Gorgeous, gorgeous, gorgeous: the cover, the writing, the story. 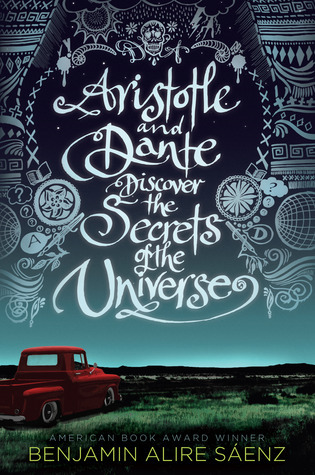 Benjamin Alire Sáenz works some serious word magic in Aristotle and Dante Discover the Secrets of the Universe. I didn’t know much going in. I knew it would be about two teenage boys and their friendship, and they had these weighty names. Were they going to be the actual Aristotle and Dante as modern teenagers? I didn’t know (they aren’t). I bet you could sometimes find all of the mysteries of the universe in someone’s hand. Each chapter is only a few pages. I LOVE this because I like being able to put a book down without having to read 20 more pages to get to the end of the chapter, but in this case I feel like it also adds to the storytelling. Every chapter is a moment in Ari’s life: a letter from Dante, a night in the desert, a conversation with his parents, a question of his identity. My life was still someone else’s idea. Ari and Dante both struggle with their ideas of what it means to be a real Mexican growing up in the 1987. More than that is their struggle of what it means to be a real person at any point. They experiment with girls and drugs and drinking and their friendship. At this point, I want to read all of Benjamin Alire Sáenz’s other books and get lost in his wonderful words. Hi! I'm Justine and I'm the blogger behind Paperback Heart. I'm mid-to-late twenties (seriously?!) and am newly transplanted to Northern California. When I'm not reading and flailing over books I might be: at the gym, off on adventure with my husband and our dog, watching the Sharks play, or just laying on the couch having a Supernatural or Doctor Who marathon. Who am I kidding? I can read and do those things at the same time - maybe not the gym, unless they want to play audiobooks over the speakers for me.